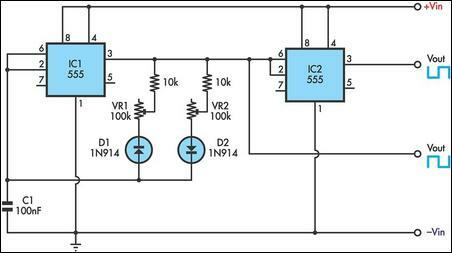 This circuit enables the on/off times of a 555 timer to be independently varied over a wide range. This is not possible with a conventional 555 circuit with the RC network being charged from the positive supply rail and discharged via pin 7. Instead, the capacitor at pins 2 & 6 of IC1 is charged and discharged from the output at pin 3. Furthermore, the charging and discharging circuits are different, being isolated by diodes D1 & D2. Therefore the capacitor at pins 2 & 6 is charged via diode D2 and trimpot VR2 and discharged via D1 and trimpot VR1. With this arrangement you can have very long on times combined with very short off times and vice versa, or you can adjust the duty cycle to exactly 50% and so on. This circuit also employs a second 555 timer (IC2) as an inverter so that complementary pulses are available, if required. If not, delete IC2.